Texas has needed a late second-half comeback to secure the majority of its wins this year. Five times in seven contests the Longhorns have trailed in the final seven minutes of a game – winning four of those times. After the third of those narrow victories, sophomore forward Connor Lammert offered a simple theory as to why Texas has been so successful in late-game situations. Over the final eight minutes of that game, Texas used only six players – Javan Felix, Jonathan Holmes, Demarcus Holland, Isaiah Taylor, Cameron Ridley and Lammert – five of whom were among the six scholarship players that returned from last year’s 16-18 team, Taylor being the lone freshman. Trailing by four at the 8:00 mark, 54-50, the Longhorns ended the game on a 22-8 run to win the game by 10 points. It’s how Texas has been winning most of its games this year. Four underclassmen – Myck Kabongo, Julien Lewis, Ioannis Papapetrou and Sheldon McClellan – all left the program after last season for various reasons. Kabongo, Papapetrou and McClellan were the Longhorns’ three leading scorers a year ago. Losing them was a big reason why Texas was picked to finish eighth in the Big 12 this season. Not only were the Longhorns bad in 2012, they were supposed to be worse in 2013. But those members of the worst Rick Barnes-led team at Texas who came back this year have led the Longhorns to a 6-1 start. Tough non-conference games remain against squads like Vanderbilt, North Carolina and Michigan State. But the Longhorns have shown they can be much improved since last year. A closer look at Texas’ first seven games shows that are getting plenty out of its perseverant returners but that one newcomer, in particular, has made his presence felt. He doesn’t lead the team in any major conventional category but he does come out on top when you look at plus-minus (how many more or less points the Longhorns score than their opponent when he’s on the floor). It’s that lone newcomer in the six-man rotation – Isaiah Taylor – who leads Texas in plus-minus at +74. The Longhorns are -9 when he’s not on the floor, making him one of two players on the team who Texas has been outscored by its opponents when he’s not on the floor, the other being Holland. Not surprisingly, Taylor also leads the Longhorns in +/- per 40 minutes at +16.5. Jonathan Holmes (+13.6) and Holland (+12.1) are the only others in double digits in this category. The single-best plus-minus performance of the year, however, doesn’t belong to Taylor but to Holmes, who was +35 in the aforementioned victory over a solid Stephen F. Austin team who won 27 games last season. Holmes was an incredible +24 in the second half and Texas was -25 in that game when he wasn’t on the floor. And here are the five worst individual plus-minus games. As expected, most of them came in the Longhorns’ only defeat so far this year, a 86-82 loss to BYU in Kansas City on Nov. 25. Texas’ starting lineup hasn’t changed much this year. 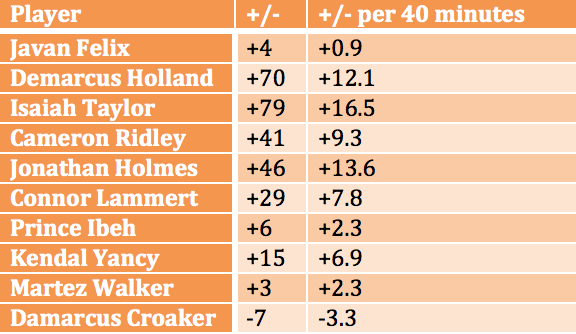 Four players – Holland, Taylor, Ridley and Holmes – have started every game they’ve played in so far. But there is one move Barnes has stuck with. He’s made a sixth man of sorts out of Felix, who has recently become the first man off the bench instead of a mainstay in the starting lineup. Has it paid off? The numbers say no. In Felix’s three starts, he was +14 but in the last four games he hasn’t started, Felix is -10, including a -15 showing against BYU. Even if you treat that performance as an anomaly and only look at Texas’ six wins so far, Felix has still been better as a starter. He’s +14 in Texas’ three wins he’s started in and +5 in the team’s three victories he hasn’t started in. 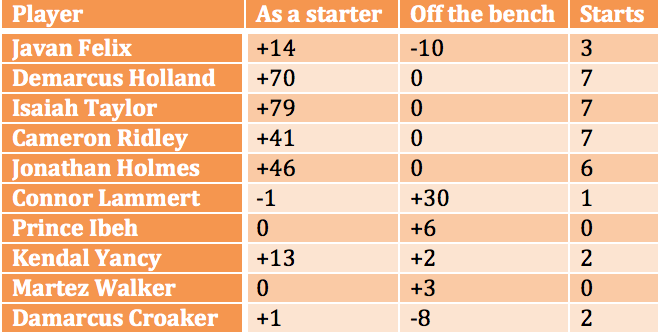 Here is a complete breakdown of how each player has done as a starter and how they’ve done coming off the bench. Of those six scholarship players who returned from last year’s team, only sophomore forward Prince Ibeh was not included in that effective late-game six-man rotation. But, as this table shows, Ibeh has saved his best basketball for the close games this year. In games decided by fewer than 10 points, Ibeh has notched a +14, including a +12 in just 16 minutes of an 84-77 win over South Alabama in the Longhorns’ second game of the season. On the other hand, Ibeh is -8 in games decided by at least 10 points.